Do you live in the Bay Area? You are luckier than you know. 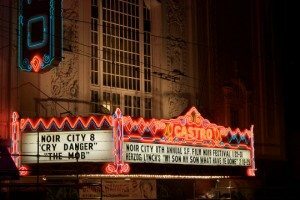 For this weekend marks the beginning of the 11th annual Noir City film festival at the Castro Theatre. It lasts ten days, from Jan. 25 through Sunday Feb. 3, and is, more or less, absolutely the best thing ever. I recommend you see everything they’re showing. I haven’t seen most of what they’re showing, but then neither has anyone else. The best thing about the festival is that most of the screenings consist of movies never released on DVD, some never released on home video of any kind, some not widely seen by anyone since their initial releases in the ‘40s or ‘50s (or ‘30s or ‘60s). Better yet, the Film Noir Foundation, which puts on the festival, spends a chunk of the money they make on restoring films, and here at the festival we get to see the newly struck 35mm prints. Film Noir, and particularly those noir films made in the ‘40s and ‘50s, the prime noir years, is a fantastically entertaining genre, more so than most realize, at least until you start watching the less famous films, the B-films, which often in noir were made by huge talents, artists who either loved noir and stayed in it, or those who started out making these dark little twisted monstrosities before going on to find fame with more mainstream features. Because they’re often B-movies, they have no pretensions, no need to appease a mass audience, no assumption that anyone’s really going to pay any attention to them at all. So you end up with the nastiest of depraved characters doing things you didn’t think anyone did in old movies. 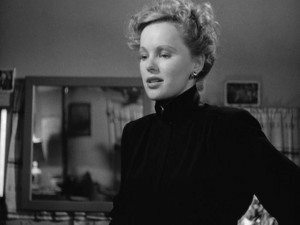 Noir focuses on the down and out, the morally bankrupt, thieves and murderers, the manipulative, the self-interested, the corrupt. Often characters start out good, but at the sight of one temptation, be it money or a woman or a chance at power, they begin their inevitable plunge into the abyss. 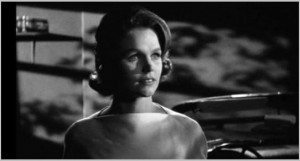 One writer summed up noir with two words: “You’re fucked.” In the first scene, you see a beautiful woman. And that’s it. Before you know it you’ve killed her husband, and now that you’ve got the insurance money in hand, she’s turned the gun on you. Noir is all about the inevitability of fate. Fight against it all you want, but you know exactly where you’re going to end up. Noir is alive to this day, even when it’s not shot in black & white, even when it’s not set in the ‘40s, even when no one wears a hat. Check out this ‘80s noir double bill I wrote up a few weeks back. Or look at Drive from ’11, the Ryan Gosling crime flick. It’s a straight-up noir plot. The hero sees a woman in scene two, he pursues her, and from there falls into complications leading ineluctably to (spoiler alert!) his death. Saturday the 26th features two of the Foundation’s restorations, Try And Get Me! and The Hoodlum. Never heard of them? Me neither. They’ve never been on DVD. You may never get a chance to see them again. On Monday there’s a triple bill of 70 minute pre-code features, i.e. 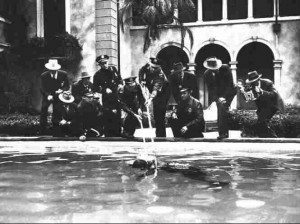 movies from the ‘30s made before the Hayes Code, Hollywood’s first self-censorship code, was put into place. Be assured many dark and horrifying acts will take place. Wednesday features two movies shot in San Francisco. Always fun to see the City back when it was noirish. Unfortunately the more famous of the two, Experiment In Terror, is being projected digitally, having gone through the latest in digital fads, “4K restoration,” which is studio-speak for “we spent some bucks priming this for its blu-ray release, it doesn’t cost us jack to show it in a theater, and by doing so we’re banking on you buying a copy for yourself” (which, to be honest, we probably will). As far as digital projection goes, 4K is the best yet, but you know what still looks better? 35mm. No matter. I’m going to see it anyway. Sterling Hayden, perhaps best remembered for his role as cigar-chewing, fluoride-eschewing General Ripper in Dr. Strangelove, is my favorite noir actor. He’s the perfect vulnerable tough-guy. He shows up Thursday night in The Come On, another one never released on DVD. I bet it’s awesome. Hayden starred in my favorite from last years’s festival, Naked Alibi (also, alas, not on DVD). 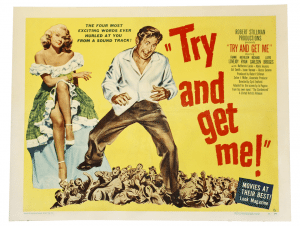 Friday we get two more digital restorations (please tell me this isn’t the wave of the noir festival future…sigh), but on the plus side, both movies are in 3D, from the original ‘50s fad. They both sound marvelous. I’ve never heard of them. See you there. That’s but a sampling. Check out the schedule yourself. Pick something, anything. You’ll have a good time. But be warned: this festival is hugely popular. The weekend shows usually sell out, and the weekday shows are packed. Come early. As a final incentive to get you excited, check out this phenomenal montage of noir clips, set to “Angel” by Massive Attack. Preferably watched in the dark, late at night, the volume up high. ← I Like to Watch Lovers Year-Round! Lucky bastards! I’d love to see some of these! I hate you all for having such a festival. Hey, Ted, you have the Cinefamily, so don’t protest too loudly.